Selfies, now it’s everyone’s favorite hobby to take selfies and upload them in Facebook, and it’s became a obsession for the teen, Teens are trying new ways while taking Selfies to impress their friends, but in this case, it became a tragedy, a man was trying to take selfie with a loaded gun, and the result, he was shot dead himself, while taking it. 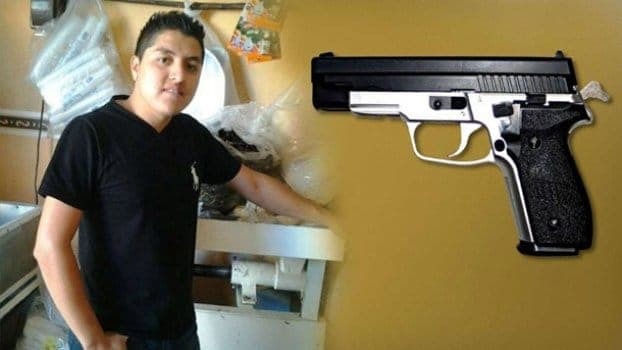 Oscar Otero Augilar aged 21, is a Mexican Veterinary Doctor was in search of taking a selfie to put it on his Facebook profile picture, this time, he wanted to impress his friends, so he thought of taking the selfie with a loaded gun, He already had many collections of pictures in his Facebook profile album, where he took the pictures with beautiful women, with a musical band, riding an expensive bike, posing in front of a luxurious car etc, and this made him to get obsessed with the selfie thing. But the loaded gun selfie thing turned out into a tragic, as he miss operated the gun accidentally while doing the selfie! It wouldn’t happen if he didn’t misused with loaded gun which he actually borrowed, well he was trying to impress his friends in Facebook and it turned out to be a tragic, he was seriously injured after the miss fire, and while on his way to the hospital, he was dead. His friends said to the Police. ” Oscar was messing up with the loaded gun in the flat, he was waving the gun and tried to take the selfie, but accidentally the gun went off, and he got shot. we have already posted that : American Psychiatric Association declares SELFIES as a disorder but people are still getting obsessed with the selfie thing, turning out into a tragic.